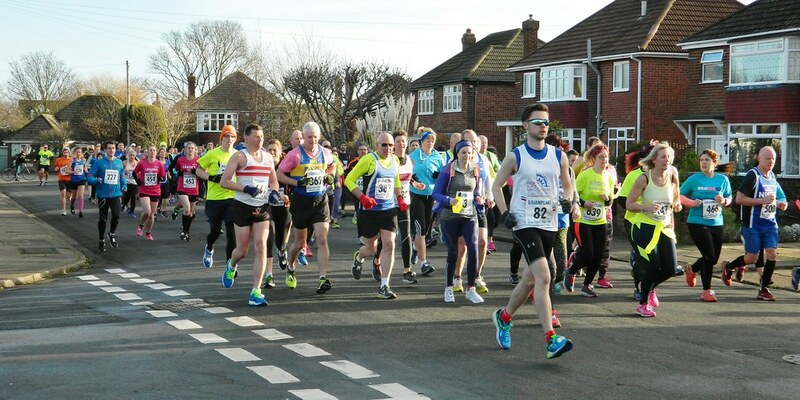 The start of the 1989 Cleethorpes New Year Day 10K with race winner, Vincent Garner (396) already to the fore. 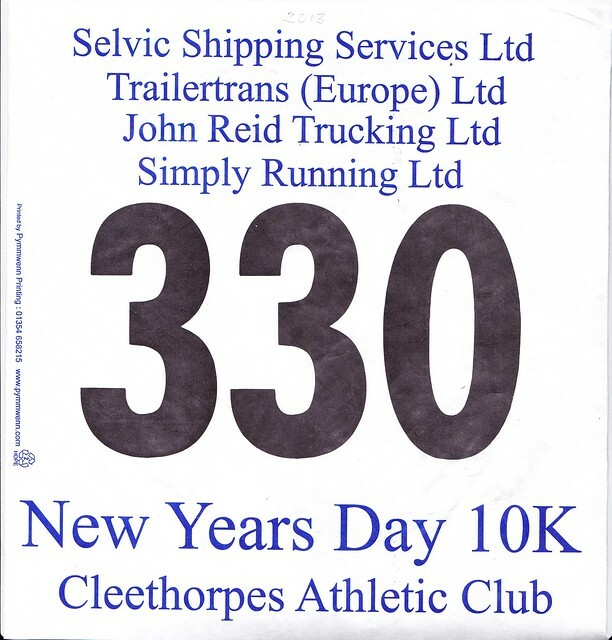 The New Year Day event first started in 1976 soon after Cleethorpes & District Athletic Club was formed. It originally started as a friendly get-together and a report in the Grimsby News of January 1979 states: “Around 30 runners set off from the Birds Nest Café for a friendly social run of around four miles”. Only the first three were recorded in the paper: John Barker, Harry Collett and John Wright, with no times shown. 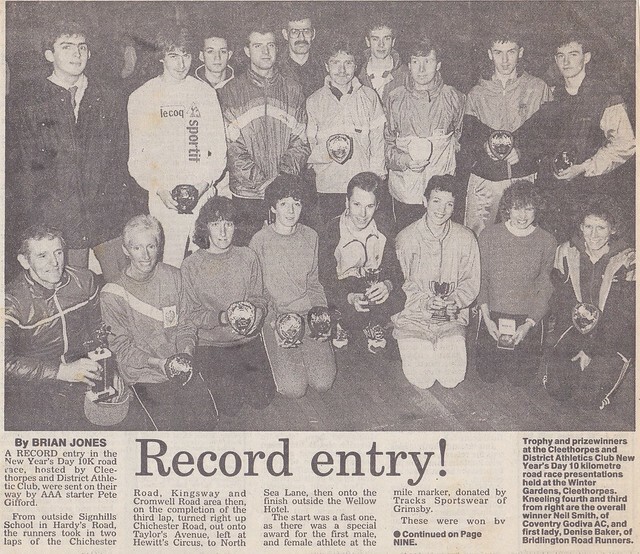 A full list of finishers were reported in the Grimsby News for 1982 and 1983 with host club Jon Ireland finishing in first place in 1982, John Molloy was second with Peter Browning third. Jon Ireland repeated his victory in 1983 with track specialist, Mark Chapman in second and Colin Wright, who, was to organize the event for the next 12 years in third. Karen Powell and Barbara Brown respectively won the ladies race for these years. 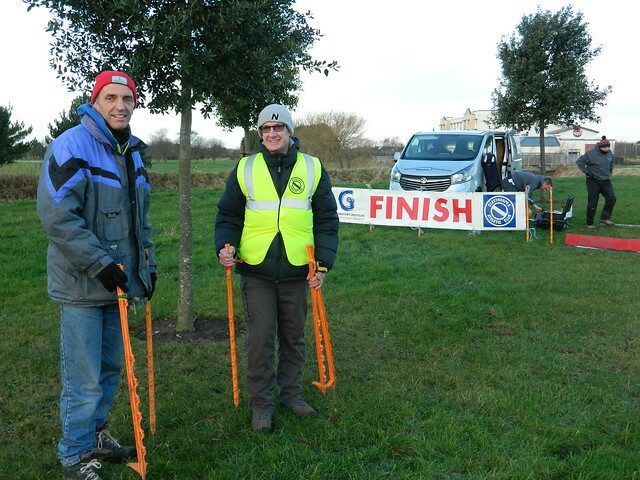 The event was over 4.8 miles from the club’s headquarters on Kings Road to the Yacht Club and back on the Marine Embankment, this included ¾ of a mile of dirt track. 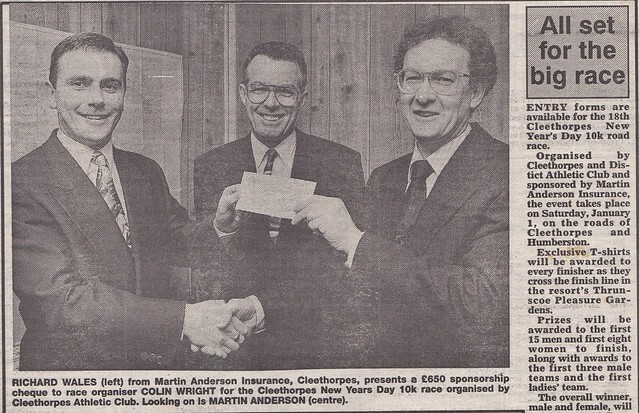 The course record for this distance is still held by Martin Anderson (25.02) which he set in 1984. 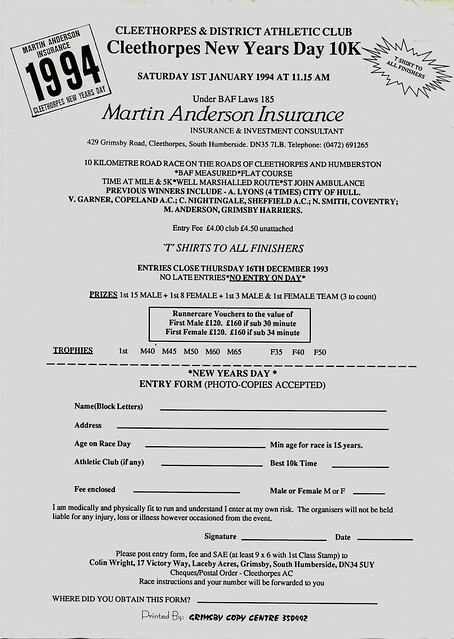 Martin Anderson Insurance was race sponsor of New Year Day from 1989 to 2000. 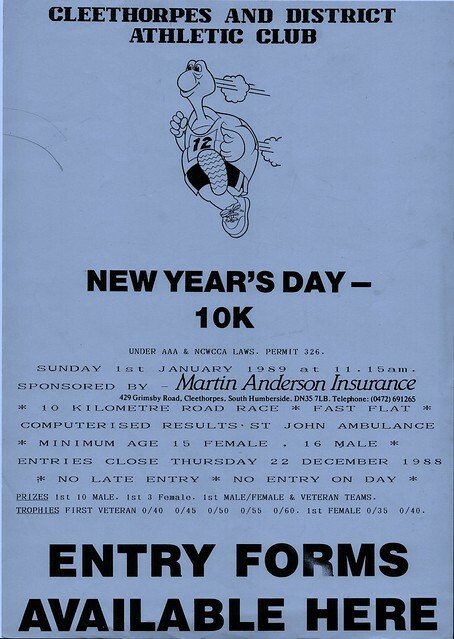 1986 Result – 11th year but first as 10k. The 1987 event was the first year that the event was run under AAA & NCWCCA rules and on the present day course, with slight start and finish variations used. This was also the last year that the old club headquarters, next to the Cleethorpes Leisure Centre, was used as the race headquarters. Carl Nightingdale, inaugural winner on the new course. 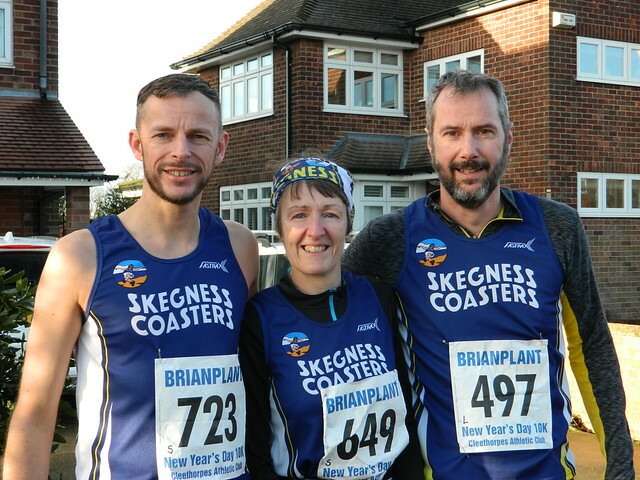 The inaugural winner on this new course was Carl Nightingdale of Sheffield AC in 31.15, with Neil Smith, Coventry Godiva, 31.24 in second, and Andy Frapewell, Gloucester AC, 31.33 third, with Jane Finch, Grimsby Harriers, 37.29 winning the ladies event. 1988 saw the race headquarters moved across the road to the much larger Winter Gardens with Neil Smith repeating his 1986 victory with a 31.23 win. 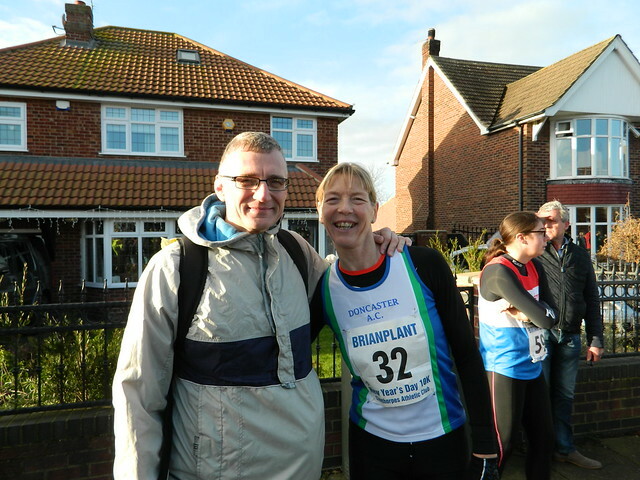 Bridlington’s Denise Baker took the ladies title in a New Year’s Day record time of 36.24. Also, of note was the infamous ‘jogging granddad’, Eddie Kirkup, taking the M55 title in 34.59. 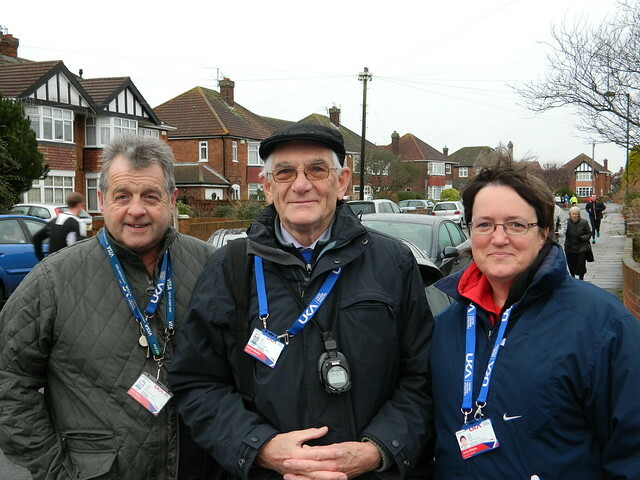 The winners: Vincent Garner (L) & Kathy Palmer, with Rob from the sponsor Tracks at the Winter Gardens. The year 1989 saw the 30 minute barrier broken for the first time in South Humberside, with the first two going sub 30 minutes. 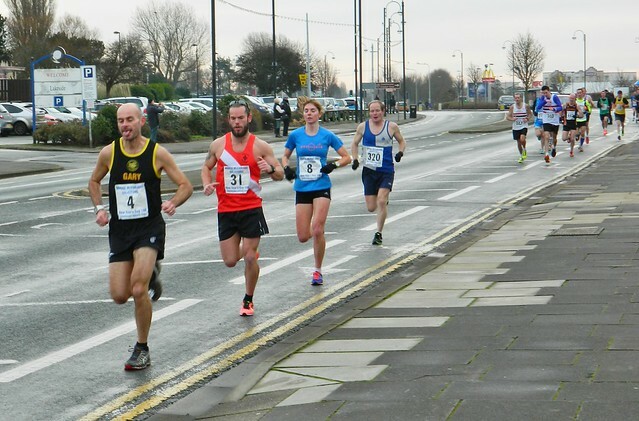 Winner Vincent Garner of Copeland AC recorded 29.36 and was clocked going through the half-way point in 14.38 and the five mile mark in 23.47, while runner-up, John Clark, Grimsby Harriers, clocked 29.53 and recorded 23.52 at 5 mile. Malcolm Martin, in third, led home Sheffield AC to the team award. Malcolm went through the mile in 4.38 and moved from 7th at this point to finish in third place and, at the age of 44, first veteran in 30.34. 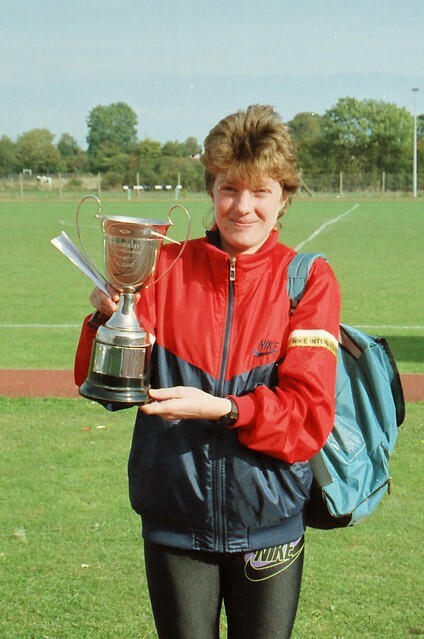 The ladies winner, Kathy Palmer of Grimsby Harriers, repeated her 1986 victory in a course record time of 35.11. 1989 Result – first time 30 min barrier broken. The dawning of a new decade in 1990 saw a record entry with City of Hull’s Andy Lyons recording the first of his four consecutive titles, winning a £100 training grant for his 30.12 clocking. He also took the Humberside Championship gold which was incorporated in the race that year. The 1992 start in Hardys Road: (L-R) 123 Scott Mitchell 31.10; 174 Darren Cooney 30.45; 246 John Clark 31.16; 172 Julian Moorhouse 31.17; Race Winner, Andy Lyons 30.05. Andy Lyons, the World Student Games 10.000 metres finalist, finally cracked the sub 30 minute barrier the fourth time of asking on New Year Day 1993. A four-year winning sequence of 30.12; 30.05; 30.03 and finally 29.32 saw Andy surpass Vincent Garner’s 1989 record by four seconds. 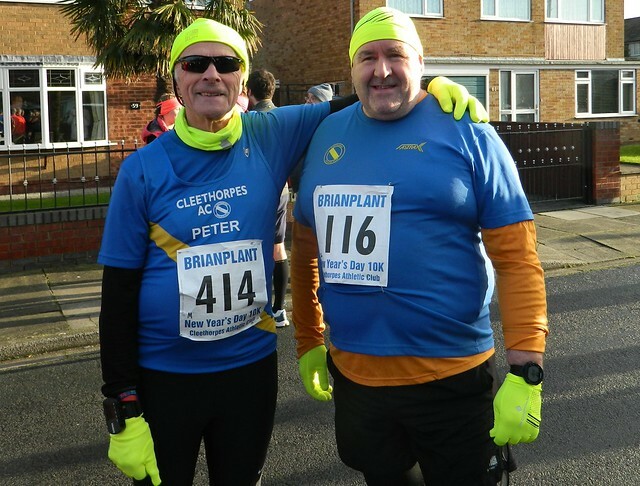 Of added interest was that in November of the same year Andy returned to the resort and ran the 11th Cleethorpes Guy Fawkes 10k and ran an amazing 29.19. This time is faster than the current New Year Day course record and could possibly be the fastest time ever run in Humberside/Lincolnshire. The ladies record was also broken in 1993 with Peterborough’s Teresa Dyer, re-writing the record books with an amazing 32.43 clocking. 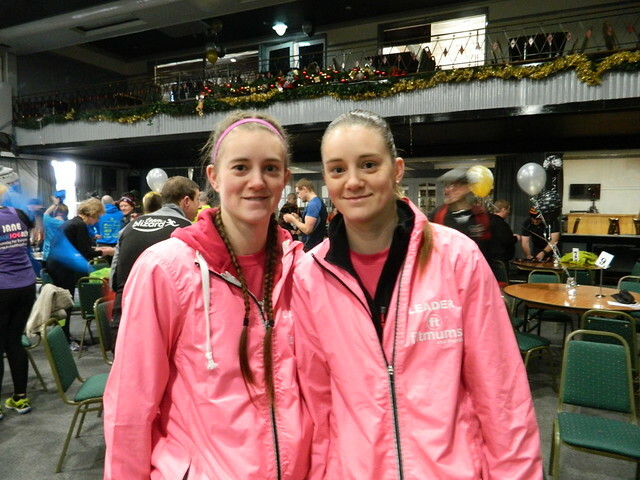 Both athletes picked up £160 in training grants for their win. 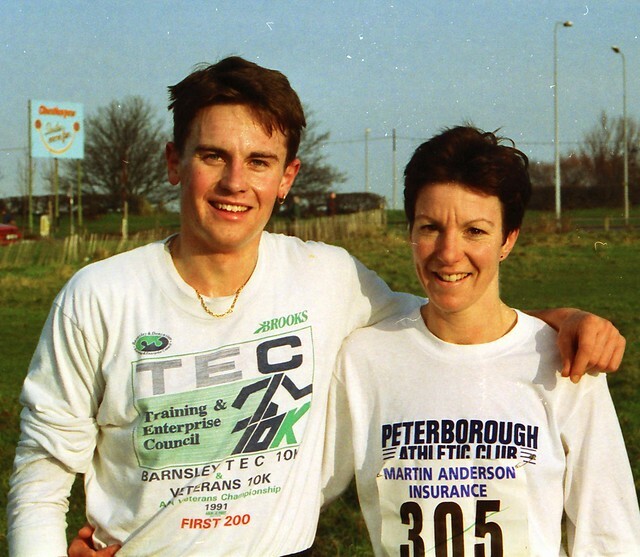 Teresa Dyer, having broken the Cleethorpes Guy Fawkes 10K record in late October of 1992, with a 33.34 clocking, was expected to record another fast time in only her second visit to the resort, and the expectations were certainly fulfilled as she knocked nearly two minutes off the previous record and 51 seconds off her personal best. 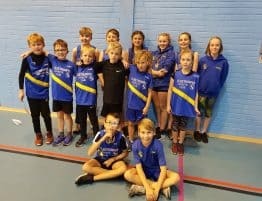 Added interest was her five mile split of 26.30, a time that would have put her second in the previous year’s UK rankings for the five mile distance. Teresa’s 32.43 clocking turned out to be the fastest time in the UK in 1993 and put her 12th on the British All-Time list. Teresa’s record for New Year Day still stands to this day. John Clark, The Flying Farmer, easily the most outstanding local road runner. 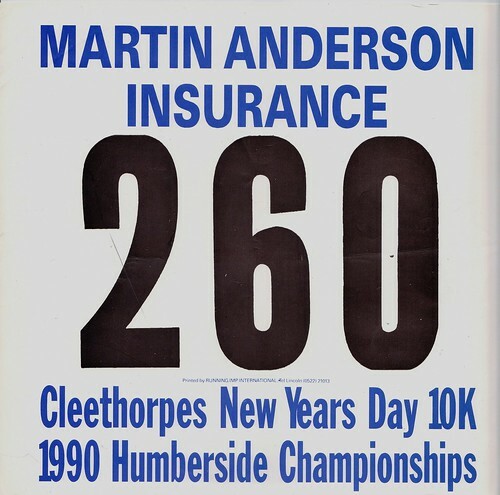 He ran 29.53 on New Year Day 1989 and still holds the course record for the Cleethorpes Five Mile, 23.35. The 1994 entry form … remember entry forms? 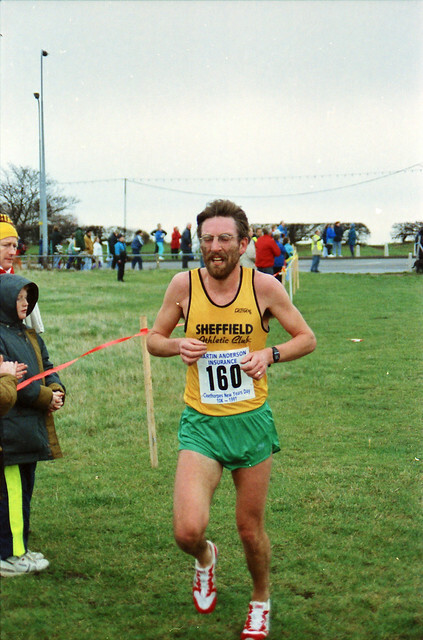 Amazingly Andy Lyons course record of 29.32 was only to last the year as Skyrac AC’s Peter Whitehead recorded 29.24 in the 1994 event, with both Rotherham’s David Tune (29.56) and Leeds City’s Julian Moorhouse (29.58) also going sub 30 minutes. Peter went on to finish in 12th place in the following year’s London Marathon in 2.12.23 and took part in the 1996 Summer Olympics. Host club’s Lisa Melkevik Mawer recorded a fast 34.49 to win the ladies with Annette Bell, Lincoln Wellington, in second (35.09) and former Grimsby Harrier Kim Bennett third in 35.53. 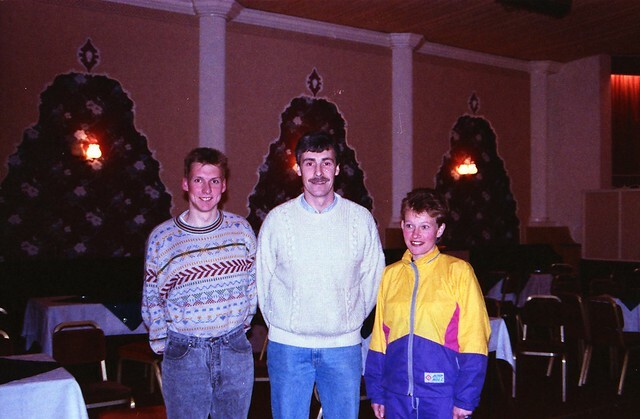 1994 Result – New male course record as three go sub 30 minutes. 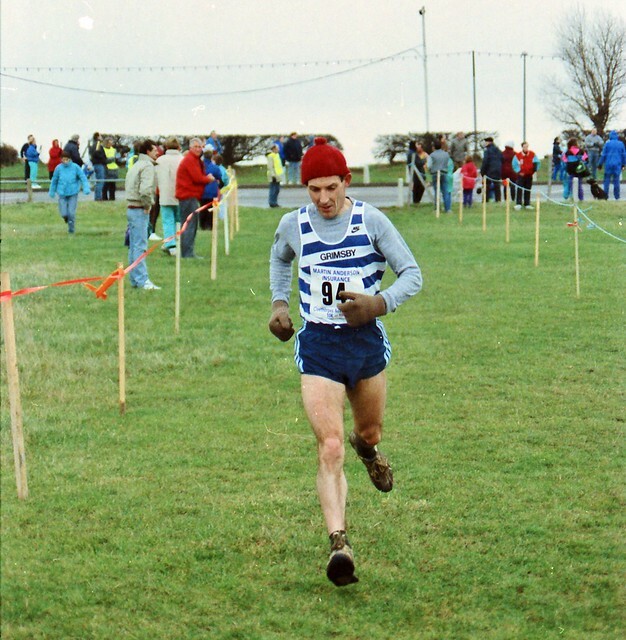 With an icy blast of cold air blowing in from the Humber the 1995 race was won in dramatic fashion by Scunthorpe based, Julian Moorhouse, running for Leeds City who, despite losing the lead at the 6K mark with stomach cramp, was able to overhaul England International Mick Thompson with 400 metres to go to cross the finish line in 30.42, five seconds in front of runner-up Mick. 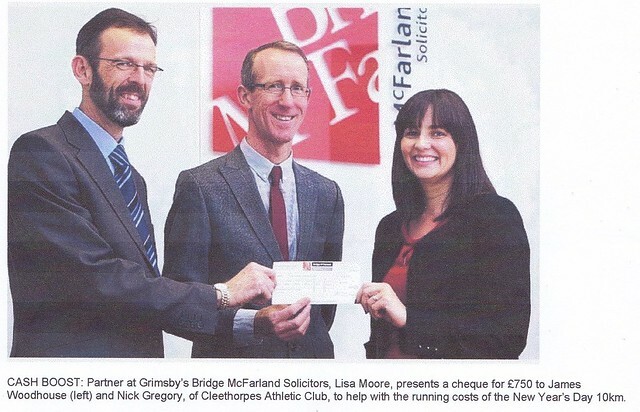 Jane Shields, the 1995 New Year Day winner, shown with the trophy for her win in the Great Grimsby Half-Marathon. Olympian Jane Shields, who ran the 10,000m for Great Britain in the Los Angeles Olympics, was the first woman to complete the course, recording 36.10 – a reflection of the harsh conditions out on the route. 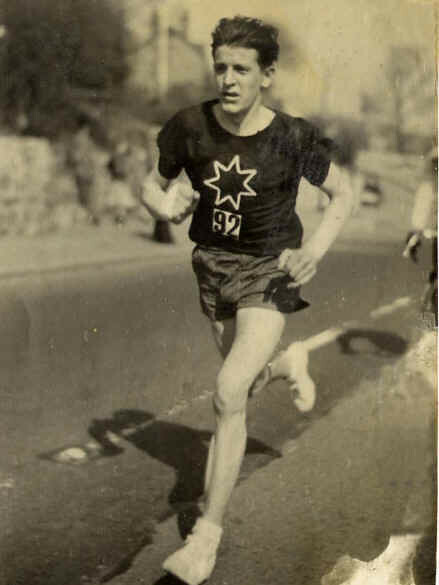 In the M65 category, Eddie Kirkup, three times winner of the Morpeth to Newcastle New Years Day road race in the mid 1950s, clocked a national ranking 40.59. Eddie Kirkup: Three-times winner of the Morpeth to Newcastle New Year Day race in the mid-1950’s. 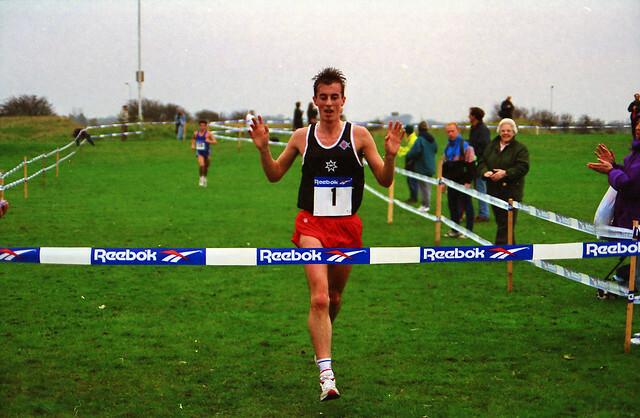 The 1996 race saw Rotherham Harriers take the team prize, led home by David Tune who recorded a fast 30.15. Runner-up Robert Holladay, 31.18, was the second counter for the team, and Michael Thompson anchored the team in seventh position. Grimsby’s John Clark was first veteran in third with a 31.42 clocking. 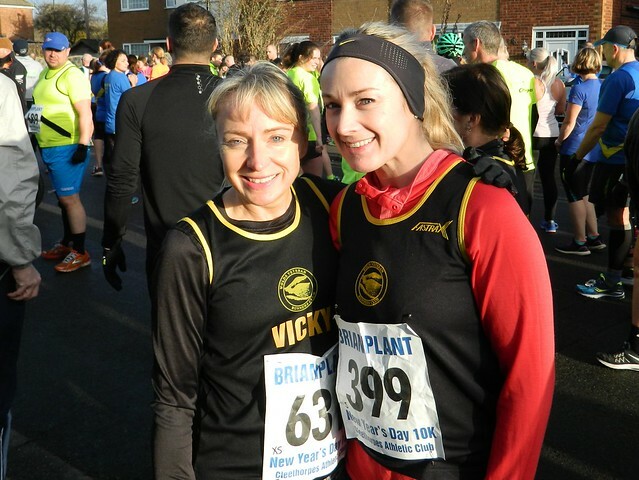 The ladies race saw East Hull Harrier Melanie Hayward recording her first New Year’s Day win in 37.10, with Carol Wild recording a world class 37.40 and W50 course record in fourth. 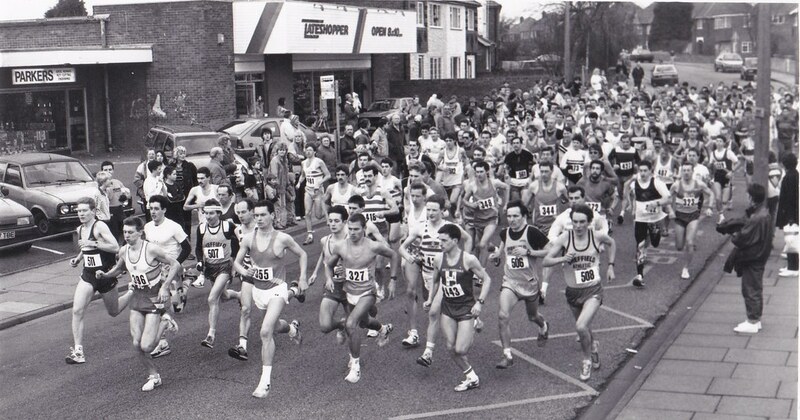 Number One: David Tune winner of the 1996 New Year Day 10K in 30.15; shown here winning the Cleethorpes Guy Fawkes 10K in 1994 in a time of 30.32. The weather finally took it’s toll on the New Year’s Day race with the 1997 event nearly being cancelled. 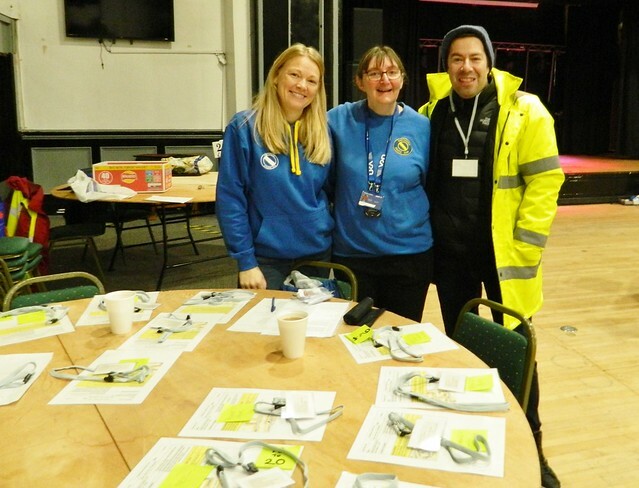 The course was inspected by officials on the day and because of snow underfoot the race was reduced in distance and only run on the main roads. Simon and Annette Bell, Lincoln Wellington’s husband and wife team, ran out the winners on a course just under four miles in distance. Business as normal was the order of the day in the 1998 race with Skrac’s Peter Whitehead, the 1994 course record holder, returning to the resort and recording a strong 30.58 in first place. 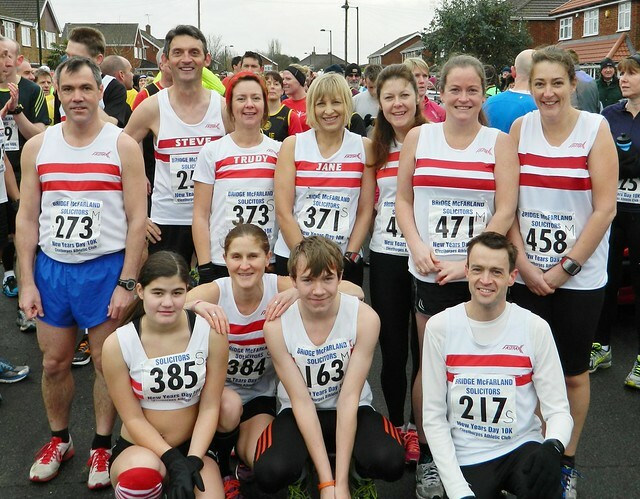 Rotherham Harriers repeated their team victory of 1996 with three different counters to their previous team victory. Paul Bennett, runner-up to Whitehead, recorded 31.34, with fellow team mate Darren Hale in third with 31.51, and Mark Ruddleston anchoring the team in fourth place to record 31.57. Lisa Mawer with 37.00 repeated her 1994 victory in the ladies event running for her new club, Harrogate Imperial. Lincoln Wellington’s Simon Bell repeated his 1997 win in the 1999 event, this time in better weather conditions over the full 10k distance. Wolds Veteran, Daphne Barclay ran out the winner in the ladies event recording a W45 category record of 38.38. For the millennium 10K the race headquarters moved again; this time to the Wellow Hotel at the corner of Chichester road and Kings road. 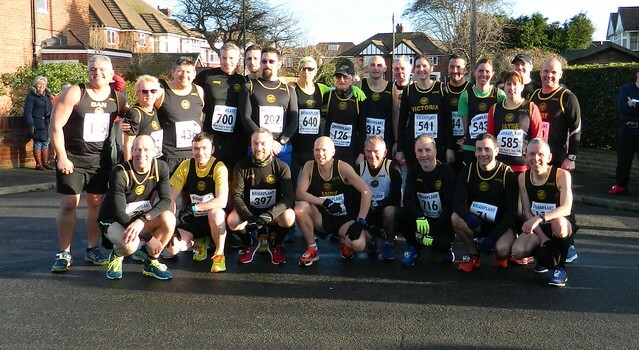 The race took place in ideal conditions with Blackheath and Bromley International runner Andrew Arrand running an impressive 30.49; over a minute ahead of runner-up Cleethorpes AC’s Philip Hinch, who led home the host club to first team place. Lisa Mawer, now running for Bingley Harriers, recorded her hat-trick of victories in this event recording 35.05. Simon Bell, Lincoln Wellington, notched up his hat-trick of New Year Day wins on the opening day of 2001; with Bingley’s Lisa Mawer keeping her title of the previous year, notching up her fourth New Year Day win. 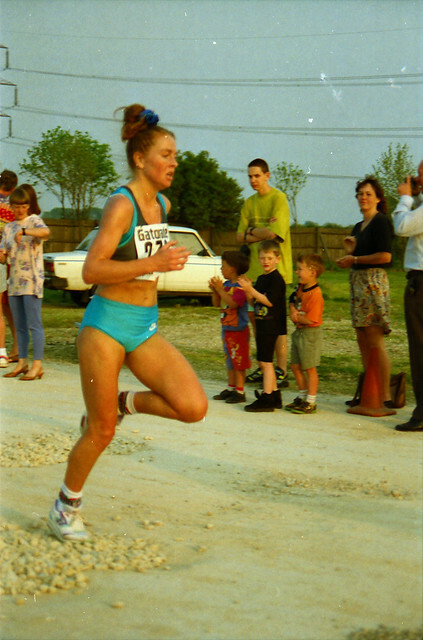 Daphne Ellmore ran one of the fastest times in the UK in the W50 category that year with a category course record of 37.22, surpassing Carol Wild’s 1996 record by 18 seconds. The highlight in the 2002 event was the performance of Daphne Ellmore in the ladies event, not only the fact that she won the ladies event, but that she ran 36.24 in the W50, to record one of the fastest W50 times ever recorded in the UK. 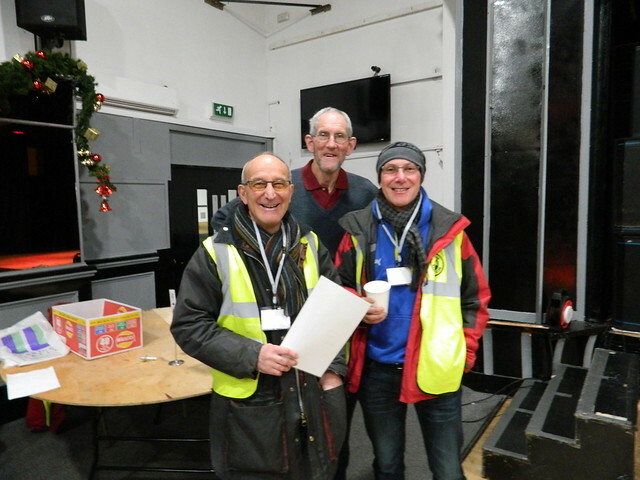 Kingston Upon Hull won the team event, led home in first place by Andy Swearman who recorded a fast 30.58 with team mate Gary Slater in the runner-up position and Andy Hughes, fifth overall, as the last counter for the north bank team. The 2003 event saw host club runner Beverley Wilson clock 37.06, holding off Daphne Ellmore by three seconds, to win the first of her three New Year Day titles. Beverley has the enviable record of finishing in the top three female runners on no less than eleven occasions! 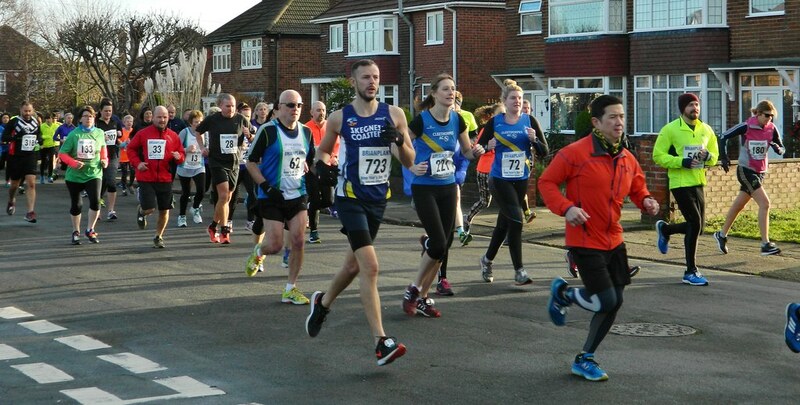 Bolton United Harrier, David Ricketts, was first in 31.15 with Rotherham Harriers Richard Harris in second with 32.25 and host club runner, Mick Jagger 33.02. Andy Swearman, the 2002 winner, returned to the resort in 2004 this time wearing the colours of Birchfield Harriers and the outcome was yet another win ( 31.37 ) Melanie Hayward, this time running for Beverley AC, took the ladies title in 35.18 repeating her win of 1996. Regular supporter of this event, Mick Jagger of Lincoln Wellington, ran out the winner in 2005 and 2006. Mick’s best recorded time on New Year Day was way back in 1989 when he recorded 31.01 for seventh place. 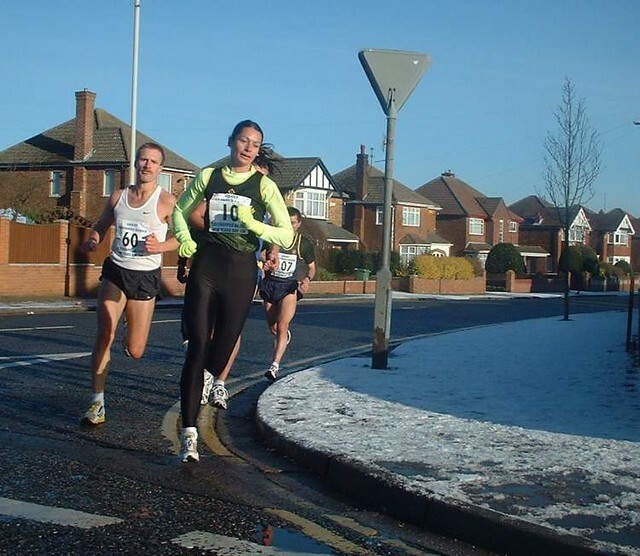 Ladies winner in 2005 was Peterborough’s Tanya Taylor who recorded 38.31 whilst in 2006 Bingley’s Lisa Mawer clocked up her fifth New Year day win clocking an amazing 34.51, thus recording a new W35 record, knocking one minute 43 seconds off Jane Colebrook’s 1993 record. This was the third time Lisa had run sub 35 minutes on New Year Day; the first being way back in 1992 when she stopped the watch in 34.45. Also of interest in 2006 was Scunthorpe’s Bob Newell recording a M65 time of 38.49 which put him third in his age group on the British All-Time list for that year. Proving that it was a good year for veterans, Daphne Ellmore ran a W55 record of 39.07 which would have been the fastest W55 time in the UK in that year but, for the fact that one month later Daphne ran 38.46 at Dewsbury !! 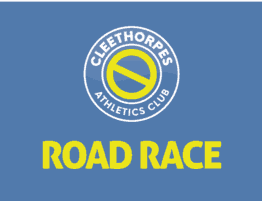 The venue for the race moved yet again, this time to the host club’s new headquarters, the Cleethorpes Cricket Club in Chichester Road. 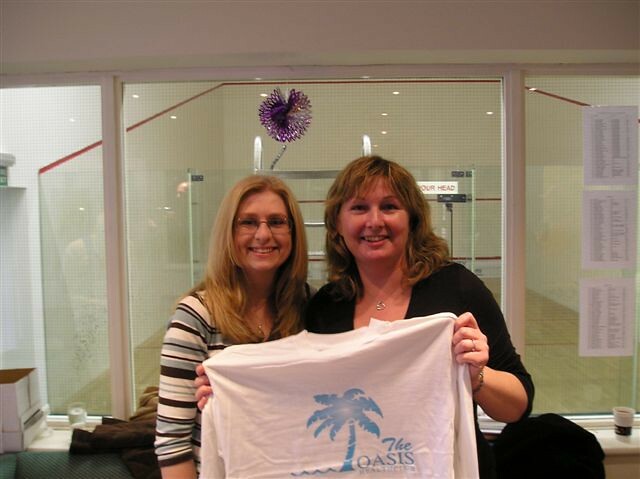 Our T-Shirt ladies, Angela & Carla at the new venue. In 2007 host club’s Beverley Wilson repeated her 2003 victory clocking 38.49 with Natalie Farrow in second in 39.22 with Daphne Ellmore in third recording 39.34. The 2004 runner-up, Pumlani Bangani, running for Salford Harriers, finally hit the number one position with his 32.31 win. 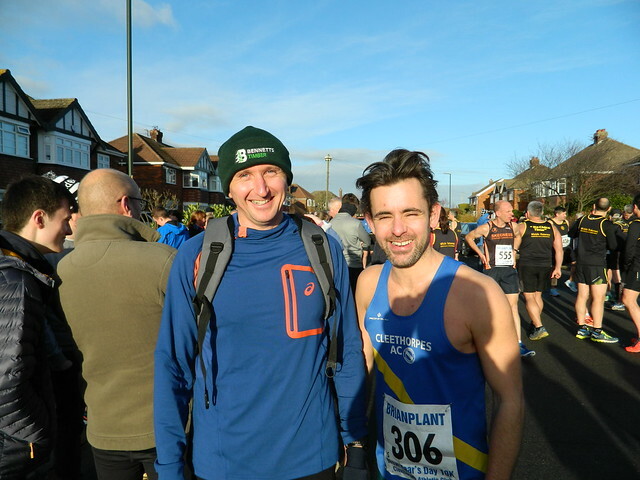 Rotherham Harrier, Philip Hoole was second in 32.48 and Leeds City, Simon Cook, also going under 33 minutes with 32.59. 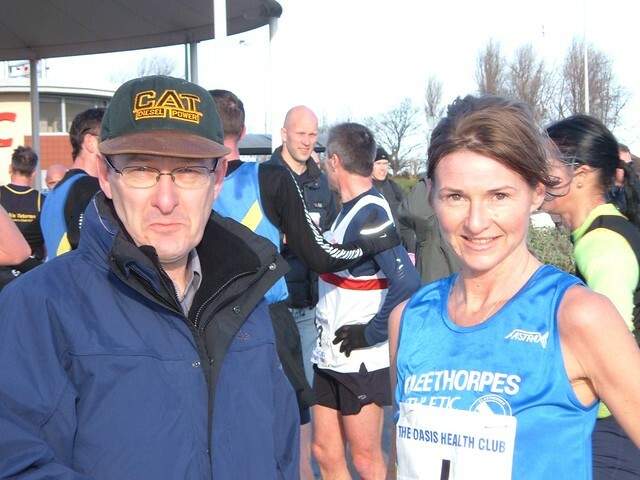 Beverley Wilson: three-times winner with former Cleethorpes AC Chairman, Colin Wright. Lincoln Wellington’s Mick Jagger secured his New Year Day hat- trick in 2008 with Hermitage Harrier Gemma Steel taking the ladies title with a 36.14 clocking. In 2009 she repeated this victory with a personal best time of 34.50. In 2011 and 2013 Gemma was a member of the Great Britain Gold medal team in the European Cross-Country Championships, and in August 2014 she ran her fastest 10k, recording 31.17 in Memphis, USA. Kingston Upon Hull repeated their 2002 team victory in 2009, led home by race winner Robert Hodges (32.38) in only his second ever run over the 10K distance; with track runner Jarratt Perkins, making his debut over the 10k distance, third overall and team mate Gregan Clarkson anchoring the KUH team in seventh position. Richard Brown was in second place crossing the line in 32.54. 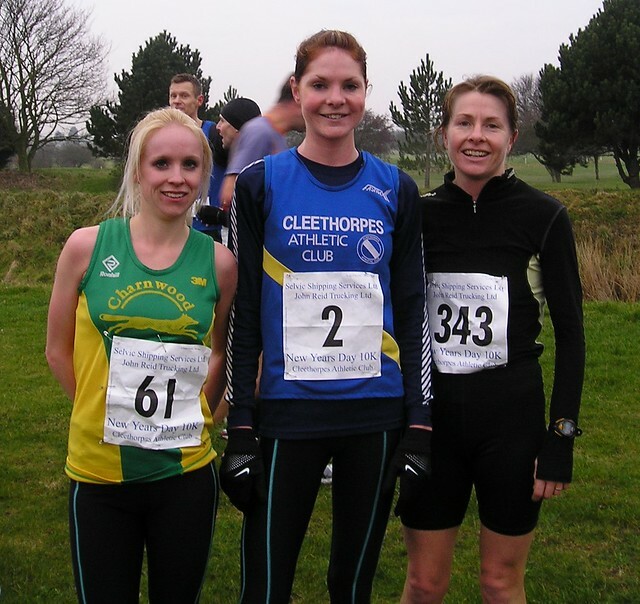 As reported above, Gemma Steel, crossed the line in 34.50 to secure her second New Year Day title, in 2009, with a 34.50 clocking with host club, Natalie Farrow, running a personal best of 35.57 and Lisa Mawer, six-times winner, in third, and first W40, recording a fast 36.57. Lisa’s time, on the opening day of 2009 ended up being the 5th fastest W40 time in the UK of that year. (L to R) Gemma (1st) 34.50; Natalie (2nd) 35.57 & Lisa (3rd) 36.57. 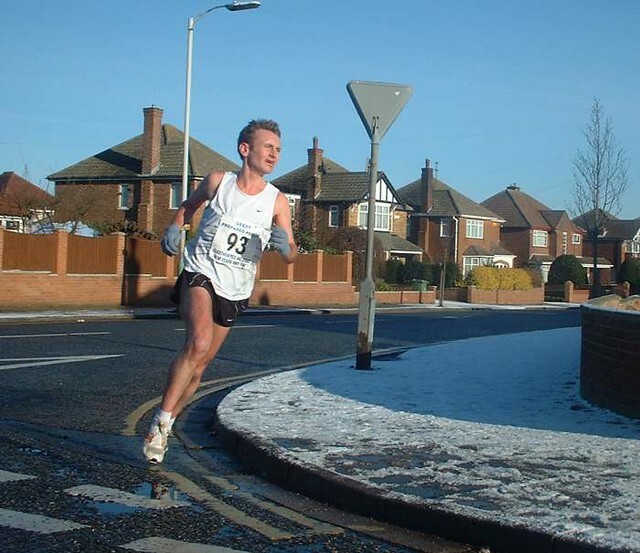 On the opening day of 2010 in the 35th running of the event, Redhill Road Runner, Leigh Stubbs, recorded his lifetime personal best of 32.02 for the distance with host club, Martin Formestone in second place (32.17) also recording his personal best. Not to be outdone, track specialist, Sam Atkin, in third place (32.22) clocked his best time for the distance. 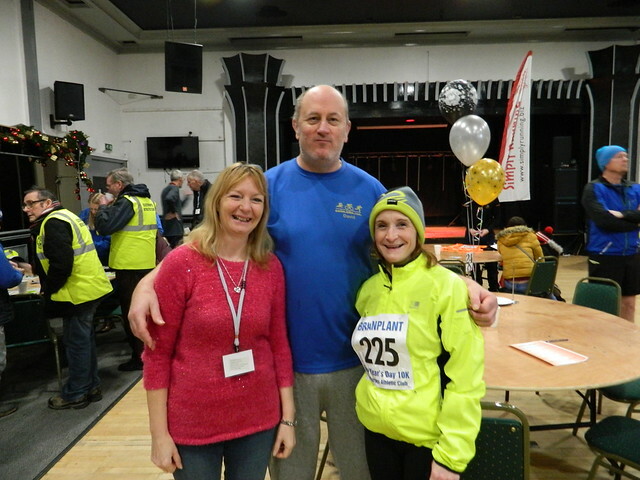 In the ladies event, Lisa Mawer, running for Wetherby Runners AC, recorded her sixth New Year Day win, stopping the clock in 37.00 beating pre-race favourite, Natalie Farrow by 25 seconds. Interestingly this was the same time (37.00), to the second, Lisa recorded 12 years earlier when winning the 1998 event. 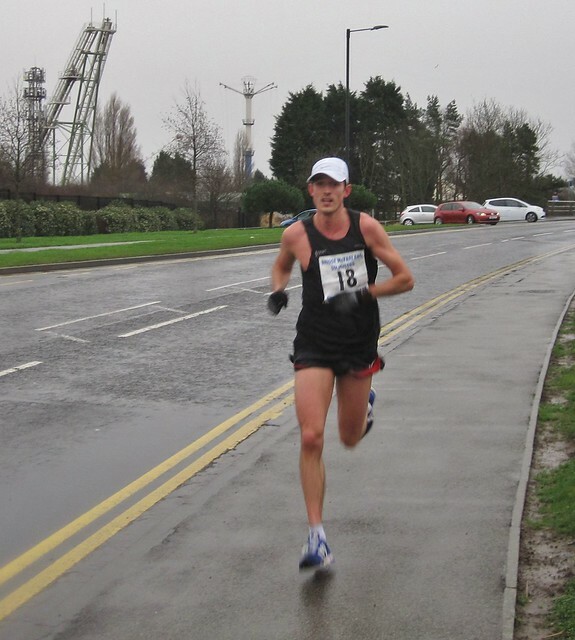 In 2011 two times runner-up, Gregan Clarkson, in his sixth New Year Day race finally hit the top spot recording 33.45 – the fourth Kingston Upon Hull athlete to win the event. 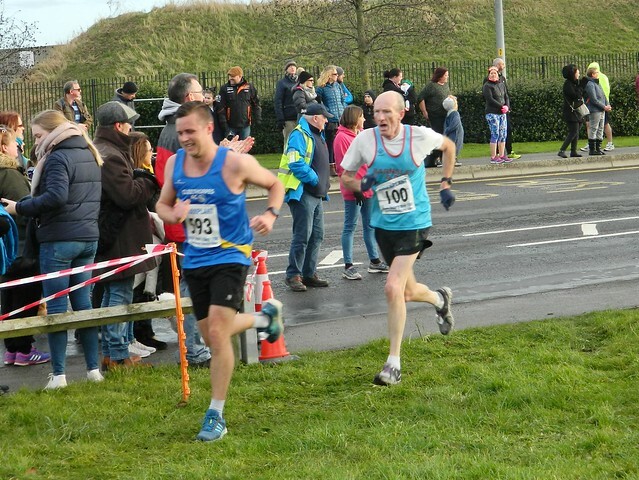 Mick Jagger, now running for Wolds Vets, was second (33.58) with Mick’s former Lincoln Wellington club mate, Richard Bateson, in third running a PB of 34.03. 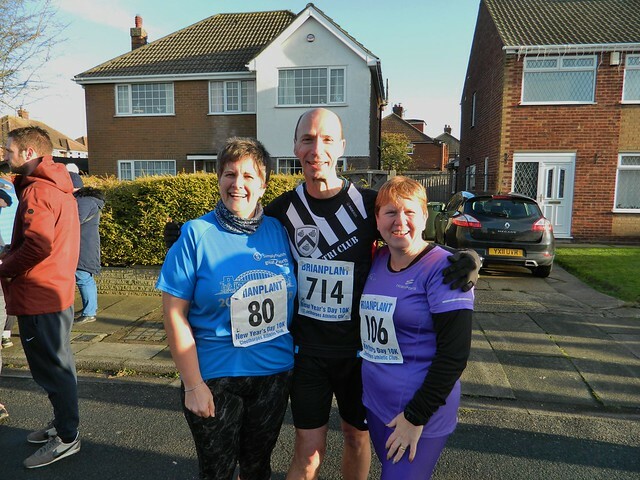 Beverley Wilson, from the host club, Cleethorpes AC, clocked her third New Year’s Day win with Jacqui Khoueiry running for Holmfirth Harriers in second and Mablethorpe’s Janine Stones in third. Reflecting the continued popularity of the event, the 2012 race saw a record entry of 485 runners; 120 up on the previous record set in 2009. The race itself was not without drama as pre-race favourite, Tony Whiteman (the double Olympian and Commonwealth medallist) running for Shaftesbury Barnet, led the field through the mile in 4 minutes 45 seconds and Two mile in 9 minutes 53 seconds; unfortunately it was at this point, whilst lapping tail enders, that Tony departed from the prescribed route and headed off down the Kingsway instead of turning left down Cromwell Road. This let Lincoln Wellington’s, Richard Brown, and Hallamshire Harrier, Carl Thackery, to battle it out for the main prize, with the former Louth AC man, Richard Brown, taking the title in 32.25 with Carl Thackery clocking 33.37. Last year’s winner, Gregan Clarkson, running for Kingston Upon Hull AC was third. 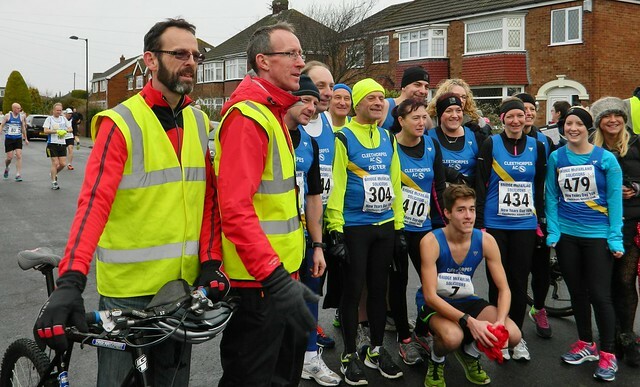 The ladies event saw a very close tussle on the streets of Cleethorpes and Humberston between last year’s winner, Beverley Wilson, of the host club, Cleethorpes AC, and six time winner, Lisa Mawer, with Lisa crossing the line with two seconds to spare, to record her seventh New Year’s Day win. 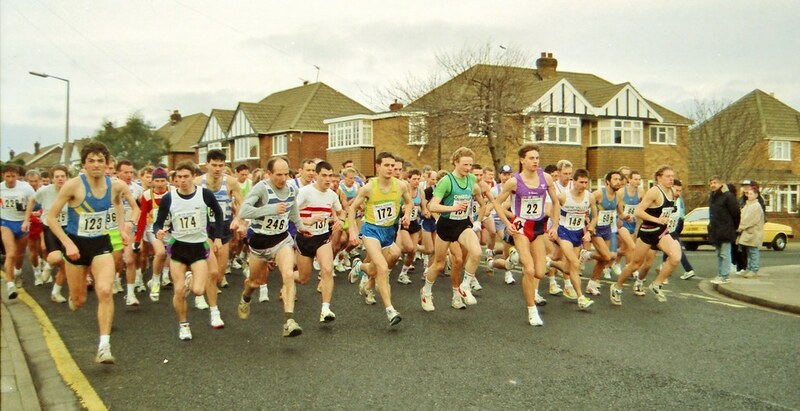 Lisa Mawer (above) winning the Askern 10K in the mid 1990’s. Lisa has won New Year Day 10K a record seven times. Her first win was in 1994 (34.49) and her latest win was 2012. She has only ever been once outside the top three in eleven appearances! 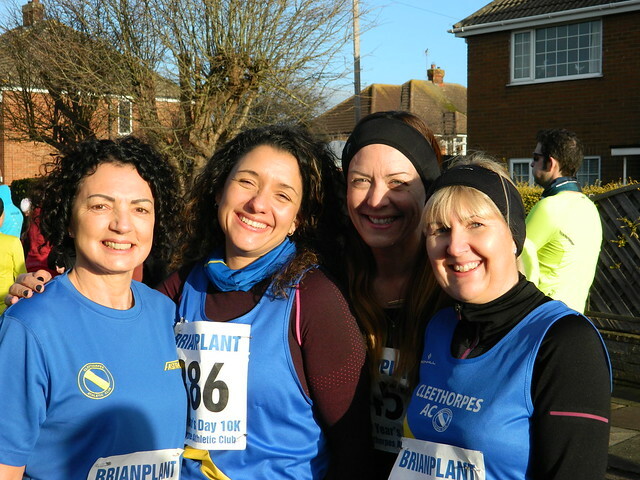 A bright sunny day greeted the runners in the 2013 event, and for the third year in succession a record entry was received for the event, with an entry of 526 and a record 451 finishers. Last year’s winner, Richard Brown, the Lincolnshire County XC bronze medallist, repeated his 2012 win doing just enough to finish 100 meters in front of the 2007 winner, Pumlani Bangani, with Chris Cotton of Kimberworth Striders in third. 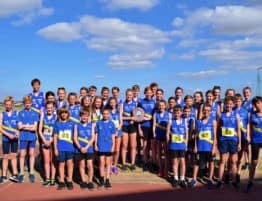 Natalie Farrow, the National Police XC Champion and Lincolnshire County Champion, in her first race for three months, recorded her first win in this event. 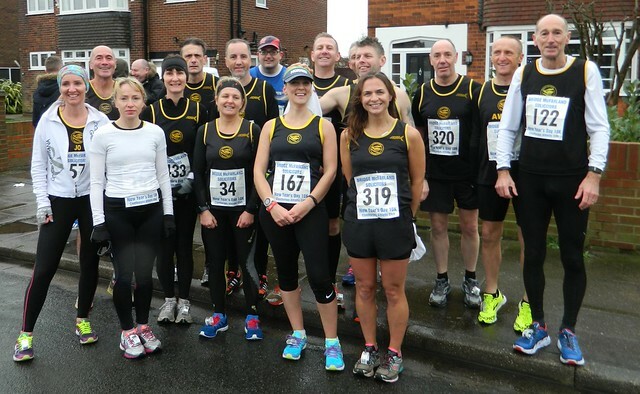 Beverley Wilson from the host club was second with Kimberworth Striders, Lindsey James, in the bronze position. The only veteran record to go was in the W70 category with Doncaster’s Rosemary Armstrong recording 57.29 in her first year in this age group. The 2013 event must also be noted for the large number of spectators that lined the route. 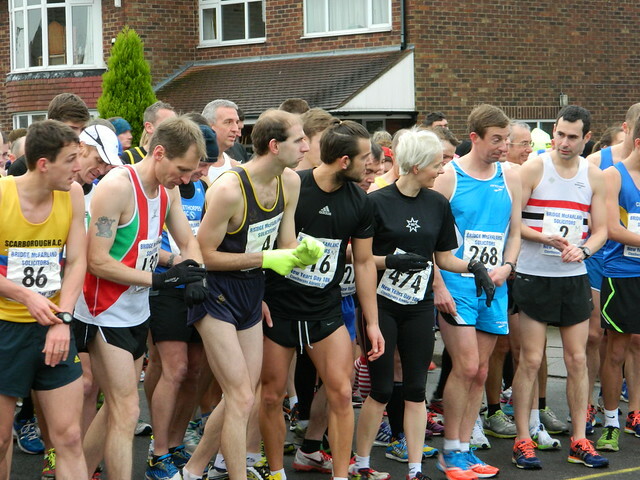 The 2014 event saw entries limited to 500 runners with 433 finishers on the day. Richard Brown recorded his third successive New Year Day title clocking 32.05 for the distance. Gregan Clarkson, the 2011 winner, was second in 33.48 with Carl Ashwood of Sutton in Ashfield third in 34.11. Jenny Blizard took the ladies title with a 38.46 clocking with host club runner, Beverley Wilson, in the runner-up position, clocking 39.30 with fellow veteran Jayne Baldwin, of Doncaster also posting a sub 40 minute performance. 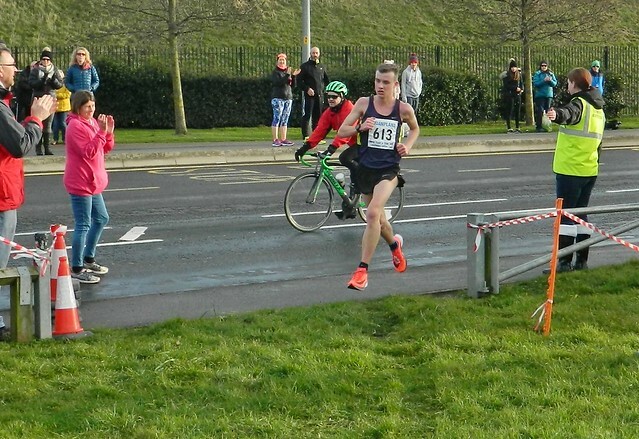 Strong winds with a cold tinge welcomed athletes to the 2015 event with New Year Day debutante, Matt Bowser, the Lincolnshire County Cross-Country Champion of Lincoln Wellington, completing a solo run in 31.53. Matt has a 10K personal best of 29.52 recorded in Telford in 2012. The women’s race was won by Natalie Burns in a repeat of her 2014 victory. Natalie, also, like the men’s winner, running for Lincoln Wellington, clocked 37.43 for the distance. 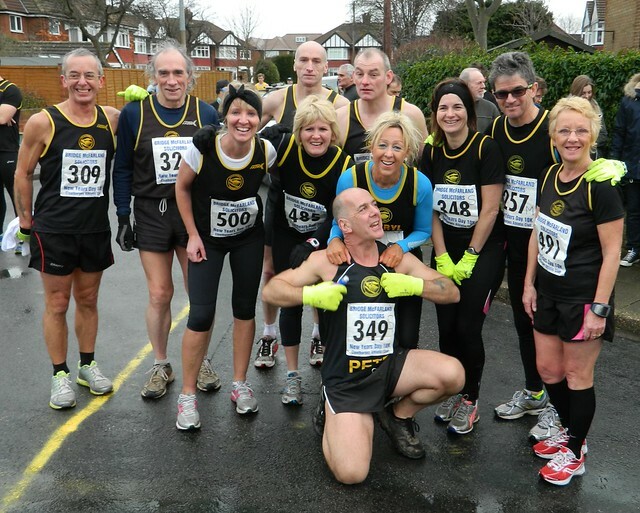 In second position was Caroline Smith 38.30 with three-times New Year Day winner, Beverley Wilson in third 39.56. The only veteran record to be broken, this year, was Brenda Edwards 2005 W65 record of 53.21 which Elizabeth Woods surpassed with a 48.45 clocking. There were 418 finishers. The 2016 event saw the entry limit raised from 500 to 550; consequently this event had a record number of finishers: 461. With the lack of wind, compared to last year’s event, fast times were expected in 2016 and the two leading runners, Matt Bowser, last year’s winner from Lincoln Wellington and John Beattie (Newham & Essex Beagles) were soon to the fore and by the mile (4.53) they had 21 seconds on the next group. They remained together throughout, going through 5K in 15.03; and with Beattie, no more than a few meters in front and with the finish in sight it was Bowser who kicked for home, stopping the clock in 30.09, one second in front of Beattie. 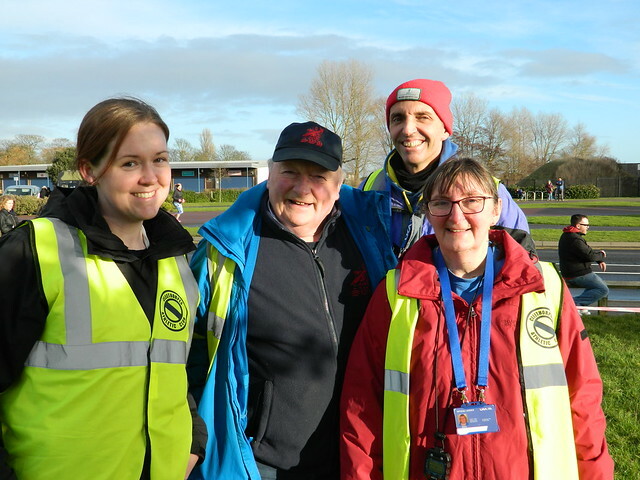 This was the fastest New Year Day time since Peter Whitehead set the current course record of 29.24 in 1994 and was also the seventh fastest time ever recorded on the course. Race Winner, Natalie Burns (8) going through the mile in 5.27. Host club, Beverley Wilson, also a three times winner, was in the runner-up position with a solid 39.36 with Jacqui Khoueiry in third. Michael McInerney, of Scunthorpe & District AC, set a new M75 course record of 51.42, surpassing the 2006 time of 55.14 set by William Bunting. The race venue, after being at the Cleethorpes Cricket Club since 2006, moved in 2017, half a mile down the road, to the Beachcomber Holiday Park. A cold and wet day greeted the runners in 2017 with the 418 finishers taking a soaking during the race. Matt Bowser, this year running for Lincoln & District Runners, took his third successive win in the event with a 31.07 clocking. 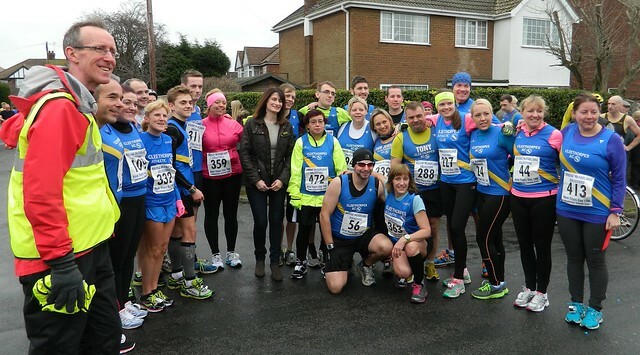 Louth runner, Natalie Burns, running for Lincoln Wellington, took her fourth New Year Day 10K title, with 36.39. Matt Bowser (2017) his third successive win. Photo © Steven Green. For the first time road closures were introduced to the race and though this led to an increase in entry fee this did not deter the runners and the 2018 event had a record number of finisher – 567. Lincoln Wellington dominated the race secured the first three positions, led home by James Straw in 31.09, with Shane Robinson clocking 31.58 and Ryan Page running a personal best of 32.34. The winner, James Straw, (31.09) just about to finish in King Road. Sophie Cowper, of Rotherham Harriers, was probably the most interesting entry to be received that year and her PB clocking’s of 56.24 in the Brompton 10 Mile and 33.53 in the Leeds Abbey Dash, both recorded in November 2017, made her the pre-race favourite. She duly obliged crossing the line in first place (35.31) Fellow Rotherham Harrier, Jenny Blizard, was second in 36.52, knocking five seconds off Lisa Mawer’s 2007 W40 course record. Rebecca Gallop, Newark AC, was third in 37.57. Also of interest was Yvonne Twelvetree (Totley AC) setting new figures in the W65 category (46.38) and Rosemary Armstrong (Doncaster AC) who in her first year in the W75 category surpassed Barbara Goreman’s 2012 record to set a new category record of 61.16. Rosemary also holds the W70 record (56.42) set in 2014. The year 2019 has a £200 bonus on offer for a new course-record; could we see the first sub 30 minute recording on New Year Day since 1994?